The Resident Tourist: Backyard Bowls . . .
You know you're back in Santa Barbara when instead of eggs and mimosas for Sunday brunch, you're rushing to Backyard Bowls for Acai and Flaxseed at 9am, trying to beat the post-workout rush. I love it. Feels good to be back. 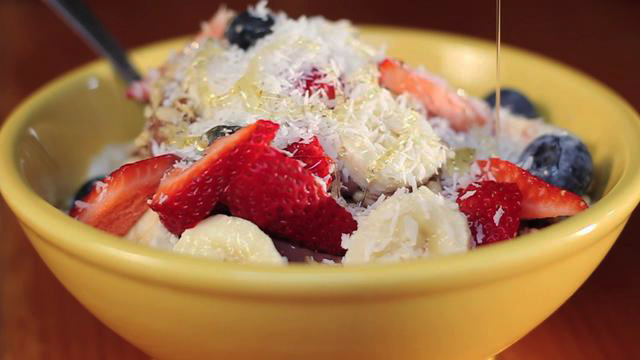 Backyard Bowls is a SB staple. The concept is simple: A bowl filled with Acai smoothie topped with a combination of sliced fruit, berries, nuts, granola, and honey. It's genius, piling our favorite health foods into a bowl of delicious nutrition. All natural, all organic, and of course, all green. There are tons of flavors to choose from, as well as breakfast bowls (oatmeal, quinoa, yogurt, or muesli) and regular smoothies. My favorite? The Island Bowl. Tip: I like to add Flaxseed for an extra level of nutrition. And if you don't have a BBowls near you, why not try whipping up one of your own?